Watch Hong Kong’s “Symphony of Lights” spectacle from the comfort of a cruise ship for a special price of HKD310 (USD40) for adults and HKD220 (USD28) for children. Prices include unlimited beverages including spirits, beer, wine, coffee, tea, and soft drinks. This nightly cruise is operated by Watertours and takes about 1 hour and 30 minutes. A dazzling sound and light show in the middle of the Hong Kong harbor, “Symphony of Lights” has been awarded the title “Largest Permanent Light and Sound Show” by Guinness World Records. The spectacle lasts about 20 minutes and tells the story of Hong Kong’s rise from modest fishing village to modern metropolis. Watertours’ nightly cruise is one of the best vantage points for enjoying the show and departs from Pier 9 Central Hong Kong at 7:30pm and Kowloon Public Pier at 7:45pm. 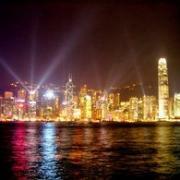 Visit http://www.watertours.com.hk/ for more information about the Symphony of Lights Cruise. Bookings can be made online or by calling the reservations hotline at (852) 2928-8882.